Welcome to Best Thing We Ate This Week, where each week, we'll have a special guest or Thrillist staff member talk about a New York dish they recently tried and loved. This week, Top Chef alumna and chef-owner of Pig & Khao, Leah Cohen, professes her love for the city's best babka. The best thing I ate this week, and it's actually one of my favorites, is the chocolate babka from Breads Bakery. I'm obsessed with it. It's consistent every time, probably because they make a billion of them, so it's always super-fresh, and they never run out of them. I've been obsessed with Nutella since I was a kid, and the Nutella flavor in that is amazing. It's really rich and buttery, but it's not super-heavy at the same time (well, I like to tell myself that it's not super-heavy so I don't feel so guilty about eating it). Whenever I go, I buy two, and I put one in the freezer. I basically compare every babka to Breads Bakery. I love that there's a chocolate element to it, and it's flaky but doughy on the inside. 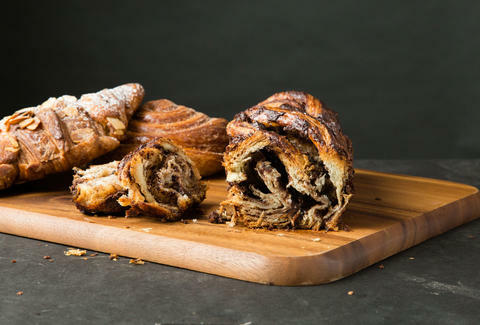 I have a girl who does my hair, and I know she's a huge foodie, so every time I go in there, I tell her, "You gotta try this, you gotta try that," and recently, I asked, "Have you had the Breads Bakery babka yet?" And when she said no, I said, "I'll bring you one the next time I see you." So it was her birthday recently and I had Caviar deliver two babkas to her salon for her birthday. She flipped out over it. Also, on Christmas Day, the Jewish side of my family goes to get Chinese food and then we bring babka with us as dessert and eat it at the restaurant.